Welcome back to our series on rental property tips! Owning a rental property can be a lot of work, and definitely a worthy challenge, but the benefits and advantages can be extremely worthwhile. We know that getting a non-recourse loan is the first step to getting a rental property, and our non-recourse loan lenders at First Western Federal Savings Bank are ready to help you on your way. Using your self-directed IRA with a non-recourse loan can set you up for incredible financial potential, but in order to make that happen, you’ll need to do a top-notch job at owning your rental property. We’re going to pick up from where we left off with some more insight on making your rental property a successful one. This can be a great guide for any first time renters, providing the information you need to set you up for a successful rental experience. Take a look at some more tips on owning a rental property, and get started with First Western Federal Savings Bank today! Location is one of the first things to consider, because this will tell you a lot about who’s in the area. If you’re near a college, you likely will have little trouble finding renters, but there are still multiple things to consider. When your property is on campus, there’s a good chance you’ll want to market towards undergraduate students. Referencing back to our original blog, this might help you make a decision towards choosing to furnish your rental property or not. The advantage is it might attract more college students, especially considering they likely don’t have furniture of their own. A downside is if your specific renters live up to the stereotypes of college, and the Tuesday bar crawls and Friday pregames could easily end up with some damage. A rental property located in a city (regardless of being near a college) might bring some recent post-grads who have just taken their first jobs. If your property is in a city, you should consider who is moving into the area, and who’s in need of a rental. If your property is just outside of a city, you might want to consider people who are more removed from their college days and are looking to settle down. Determining who will likely seek your rental property is crucial to figuring out the design and look of your property, as well as how you’ll market your space accordingly. Additionally, think of proximity in correspondence with location when considering your demographic. Close to bars, restaurants, and a lively social scene? Or are the nearest establishments a Walmart and a gas station? Regardless of how great your property is, you’ll need to think again of who is going to be looking for this space to live. Twenty-somethings might be looking for something a little closer to the action, people in their thirties might be more keen on something a bit quieter (though this is a guide, not a guarantee). The demographic piece of the puzzle is thinking about who you think would want to live into your space, the marketing component is demonstrating why they should choose your property. Your property absolutely needs to have a web presence—if it’s one property (versus, say, an apartment complex), you won’t need a website to advertise. However, you will need to make your listing available and easy to find. Setting up a listing on websites like Trulia or Zillow are relatively easy to do, and are a great way to put your place on the market. Even posting on Craigslist is a decent option—but no matter where you post your rental property, photos and details are key. Take well-lit photos that really demonstrate your space, highlight the benefits of your property (including rental features and location/proximity to other establishments), and make it easy for people to get in contact with you. As another marketing option, make it known to family and friends that you have a rental property. Sometimes even just getting the word out to those you know can inspire connections of other people needing a place to live. There are certainly pros and cons to renting your property to the ones you love—be sure to weigh out both before handing the keys to someone close. As you’re marketing, the other main thing potential renters are going to look at is your listing price. You need to set something that’s competitive, will generate a profit, but something that’s also reasonable. Take a look at your competitors, and see how you stack up. It’s OK to keep your price listing within the same range (or exact) to your competitors—or at least, in cities and places where there’s high demand for places to live. This is because everyone needs a place to live, and if a living situation falls through for a person in one location, they’ll certainly be onto the next. And the next place just might be yours! When potential renters come to check out your property, they’ll be able to tell almost instantly if you’ve set a reasonable price or not. You run a risk of not getting renters if you spike the price unnecessarily, and if anything, it’s a pretty unconscionable move to try to rip people off who are just trying to find a place to live. Keep it reasonable or set the price far too high—either way, you’ll quickly be known for your choice. 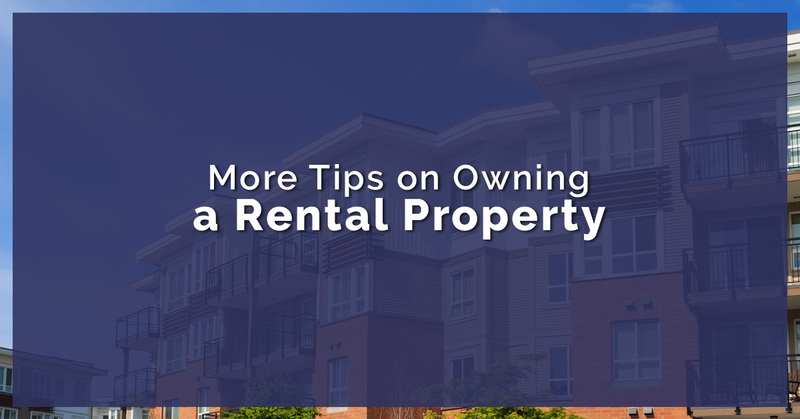 We’re going to continue on the topic of more tips for owning a rental property in our next blog. But if there’s one thing that can be said with certainty, it’s that First Western Federal Savings Bank is your first stop to making all of this happen. Our non-recourse loan lenders are here to help you get your financial potential started—contact us today!